Over the last ten years mobile payment systems have revolutionised banking in some countries in Africa. In Kenya the introduction of M-Pesa, a new financial services model, has transformed the banking and financial services industry. Giving the unbanked majority access to the financial services market it has attracted over 18 million subscribers which is remarkable given that fewer than 4 million people in Kenya have bank accounts. This book addresses the legal and regulatory issues arising out of the introduction of M-Pesa in Kenya and its drive towards financial inclusion. It considers the interaction between regulation and technological innovation with a particular focus on the regulatory tools, institutional arrangements and government decisional processes through the examination as a whole of its regulatory capacity. This is done with a view to understanding the regulatory capacity of Kenya in addressing the vulnerabilities presented by technological innovation in the financial industry for consumers after financial inclusion. It also examines the way that mobile payments have been regulated by criticising the piecemeal approach that the Central Bank of Kenya has taken in addressing the legal and regulatory issues presented by mobile payments. 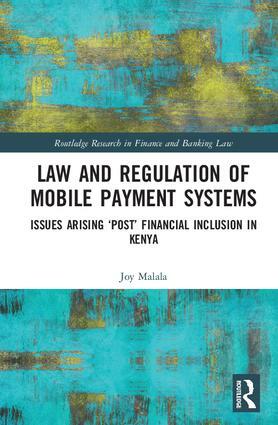 The book argues there are significant gaps in the regulatory regime of mobile banking in Kenya. Joy Malala is a lecturer at Strathmore University, Kenya.